The listings on the following pages show all bus routes that have operated in the Chelsham and Warlingham Village area from the first bus in 1921 right through to the present day and are listed in starting date order, showing Route Number, Bus Operator, Start and Finish date and Route details. Please note that there is not enough space to list fully all minor route variations, only significant changes are shown. Also please note that the various Contract services that operated on behalf of Costain & Sons in the 1920's and School Contract journeys are omitted. 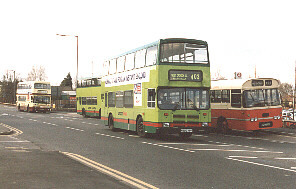 Shown in this busy scene photographed early in 1995 at Chelsham (Warlingham Sainsbury's) are left to right, Kentish Bus AN working the Route 519 school contract from Redhill to Warlingham, which at that time worked empty to and from Dunton Green Garage, now also closed. A London Links Volvo on the 403 still showing the London & Country fleetname waits for it's next duty, another London Links Volvo on the 403 starts off for West Croydon by turning on the roundabout. An East Surrey Route 553 bus waits for it's next trip back to Caterham. All this within a few minutes and no cars in the way to spoil the picture, they are all in the Sainsbury's car park! Please click below to select details of every individual route that has operated in the Chelsham and Warlingham district. They are listed in Route Number order. The following routes operated in the Chelsham and Warlingham area before the opening of Chelsham Garage in 1925. The following routes were operated in the Chelsham and Warlingham area by Chelsham Garage or jointly with another Garage for the period when Chelsham Garage was open.